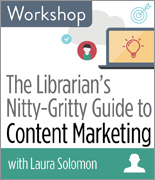 CHICAGO—ALA Editions announces an exciting new workshop, The Librarian’s Nitty-Gritty Guide to Content Marketing with Laura Solomon. This workshop will last 60 minutes and take place at 3:00pm Eastern/2:00 Central/1:00 Mountain/12:00 Pacific on Wednesday, July 20, 2016. Has your library been promoting itself online through various social media channels (blogs, Facebook, etc.)? Have you seen mixed results? One way to be more effective online is by moving beyond the promotional mindset of traditional marketing and by embracing a different way of creating content that will engage and help serve the needs of your community. Are you ready to make your library’s online efforts more effective? Welcome to content marketing. Content marketing may be a new term for librarians, but it is a growing and effective trend in the business world. In this workshop, Laura Solomon will introduce you to content marketing by teaching you how to create a content strategy and how to implement it. This workshop will explain this growing trend, as well as give you and your staff the tools they need to get started on creating your own content strategy. Laura Solomon is the library services manager for the Ohio Public Information Network and former web applications supervisor for the Cleveland Public Library. She has been working in web development and design and conducting classes in public libraries and as an independent consultant. Laura was selected as one of Library Journal’s “Movers and Shakers” for 2010. She earned her MLS from Kent State University. Visit her blog at www.meanlaura.com. ALA Editions publishes resources used worldwide by tens of thousands of library and information professionals to improve programs, build on best practices, develop leadership, and for personal professional development. ALA authors and developers are leaders in their fields, and their content is published in a growing range of print and electronic formats. Contact us at editionscoursehelp@ala.org.